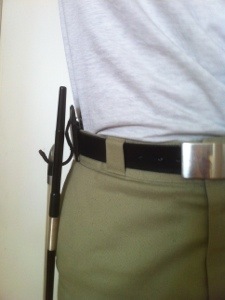 Steve Berry from the UK has developed a new alternative to the bow quiver & free-standing, floor-mounted bow holders. 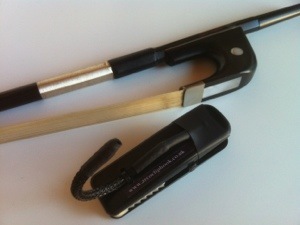 Inspired directly by l’Orchestre de Contrebasses, he makes and offers for sale the Arco Clip Hook that enables a player to keep the bow ready at hand, on a hook that can be attached at a player’s side with a clip, locating into the trouser waistband, or suitable belt. The bow retaining hook is metal and covered with braided cloth and rubber, protecting the bow’s frog. The hook also terminates in a rounded metal ball, shrouded in rubber and so there’s no danger of encountering a sharp edge if making a hurried grab for the bow.